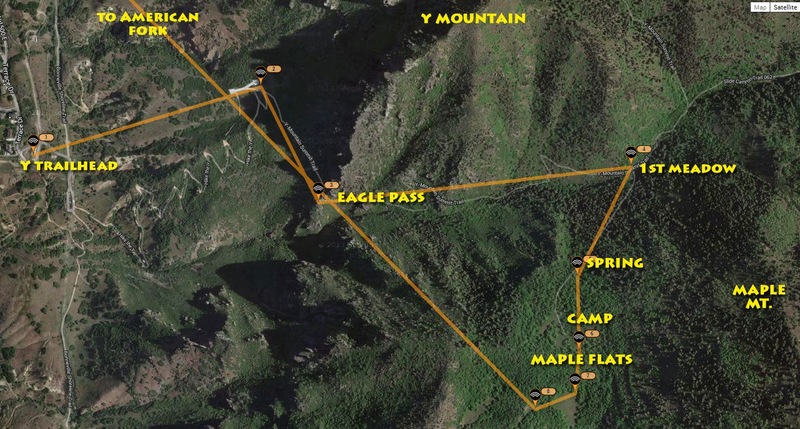 ..October 11th SEARCH FOR LAUNCH SITE….. PIONEER TIMBER SLIDES….UP AGAIN WHERE EAGLES & OTHERS DARE! 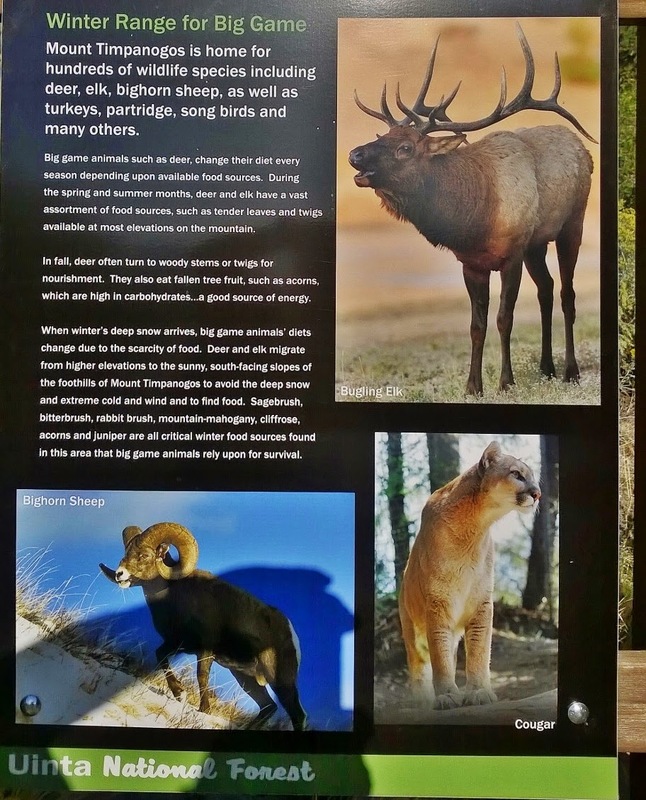 Trip #10 – Elk Hunt on Mt. Nebo from Monday Oct 6 on….report SOON! 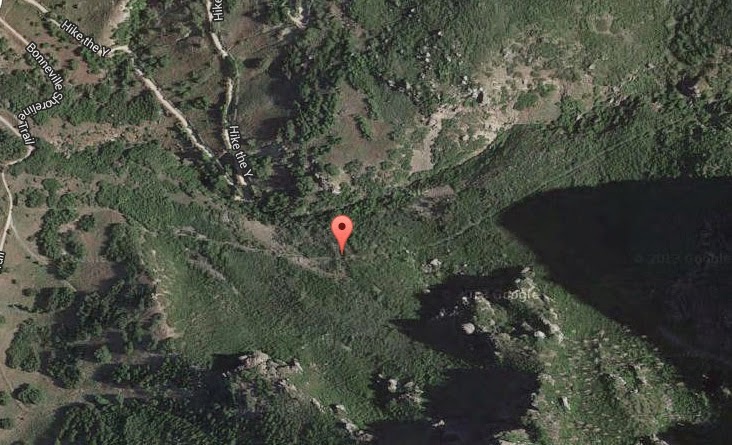 REPORT ON RECENT —Friday Oct. 3 EXPLORATION ON SLIDE MT. …SOON! ……by the way “80th” has a much better ring to it than 79th….so…..
…….“80th” will be the big year for me! Friday, Sept. 26th….STUNNING UPDATE AT END OF THIS POST:. 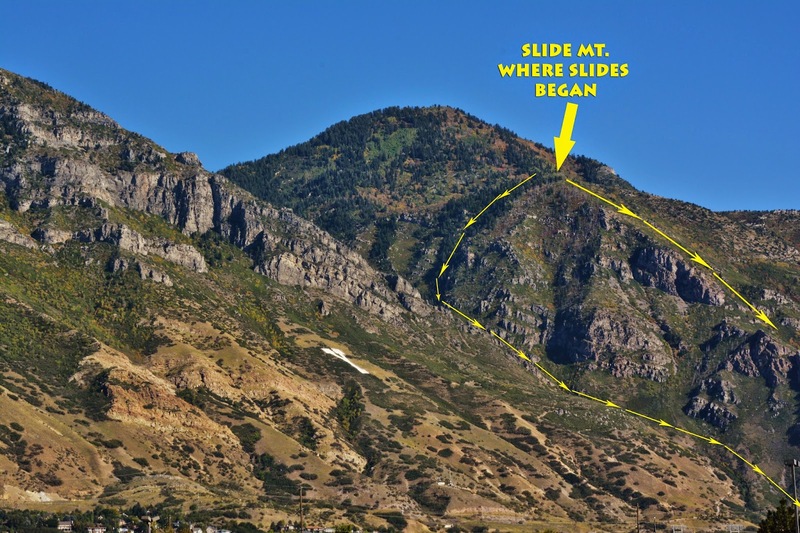 TIMBER SLIDES DOWN SLIDE MT. critical to the building of Provo. 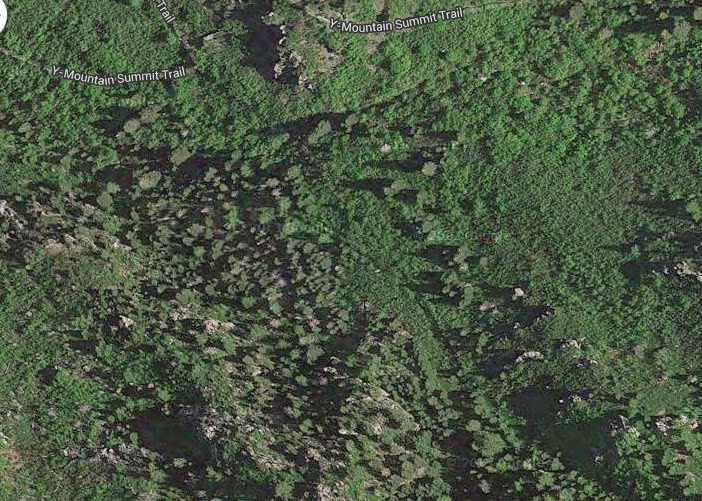 I hope to find actual artifacts, and other features besides just a “scar” and “pathways” on the mountain. Using my cell phone I’ll actually send a message from up there along with a photo or two..
Then from the top I’ll follow the pathway down to the foothills….and report. 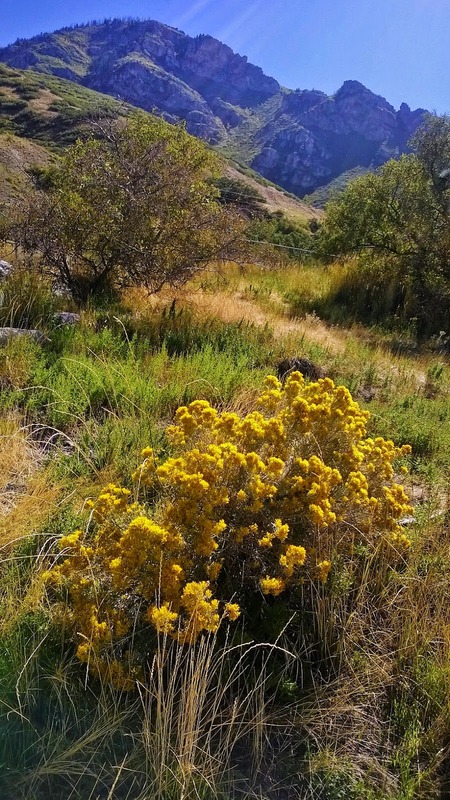 Fall is pretty well here as the Gray Rabbit Brush is in full bloom. Looking up at my objective…the top of Slide Mt. where I hoped to camp….But I noticed that there was still too much foliage…..a problem to be able to find what I’m looking for. 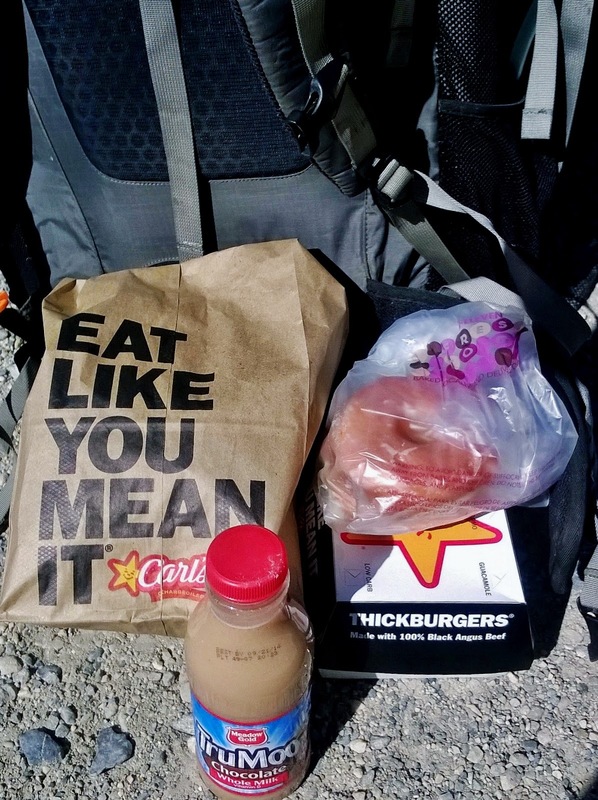 My intention was to take this double deal, with my ticket from the BYU vs Houston game, up the mountain and have like a picnic rather than “lightweight backpacking” food but I had to take a gallon and a half of water as I ran short on previous trips and the pack weight was just too much…..so it started being a bit tough! There were a few hikers….all leaving me in their dust! 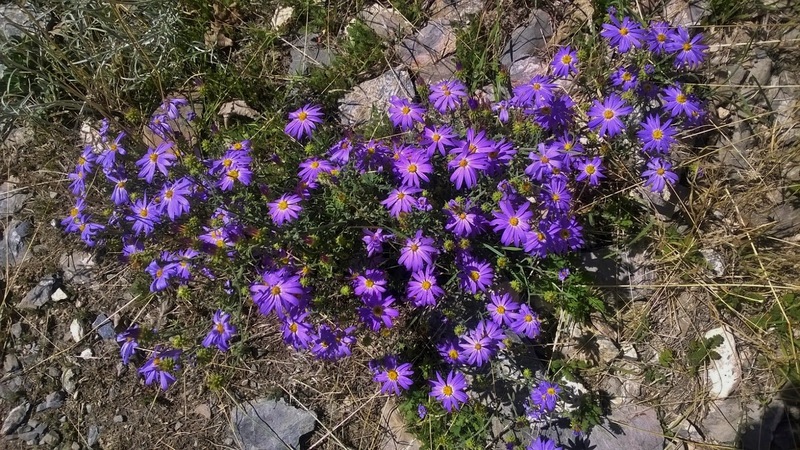 Of course I focused on the beautiful flowers as I struggled up to the 6th switchback. UPDATE: The weather report has everything trending down, maybe this exploration will have to be done later after getting my elk…quickly (I’m being optimistic …of course) and before I head for Idaho & Wyoming mid-month, , or even until next Spring. Hope you’re having a good laugh at this old geezer eating crow again.…but you can count on me not giving in easily.…but doing my darndest to achieve my goals…no matter what my age! HOW SWEET IT WILL BE TO HOPEFULLY….GET THE LAST LAUGH! I have a hard time getting used to being an old guy….and forced to work harder at getting and keeping in shape to be able to do this sort of thing….but it will be done …..just give me a little time and I WILL YET BE UP THERE WHERE EAGLES DARE! 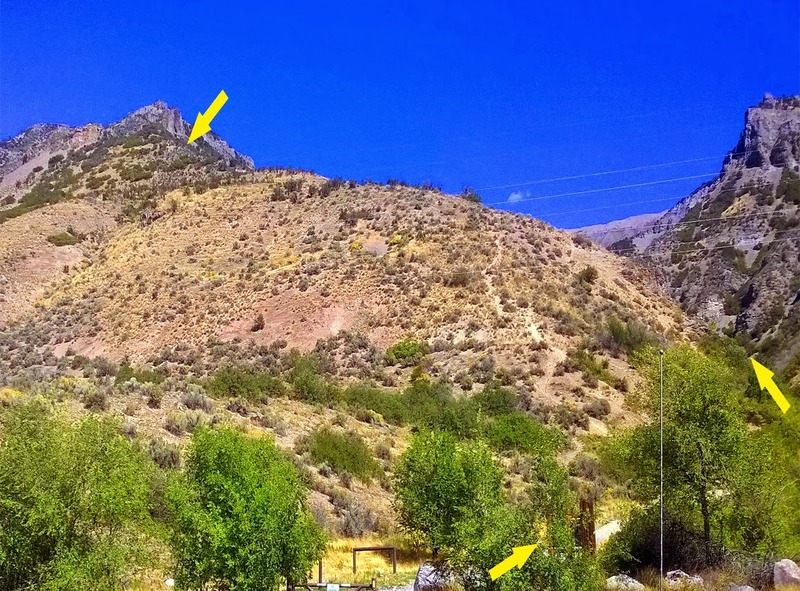 .Then TODAY the 26th…..doubling my workout from yesterday, going up Grove Canyon until the trail swichbacks up high towards the front of the mountain as seen below..
..now two days of rest and hopefully ……. Monday & Tuesday back up on Slide Mountain. The weather moving in this afternoon (Friday), by tomorrow with a 25 degree drop in temperature, rain, and snow above 8,000 ft., but hopefully Monday & Tuesday improved when I will attempt my last exploration on SLIDE MOUNTAIN…..if the weather works out…I’ll continue my SPOT Tracks from Switchback 6, then at the Y and up the mountain, but with lighter load: No .45 Colt Defender, no heavy professional photo equip…just point-and-shoot camera and cell, less water, light weight food, etc. I’ll cross my fingers…and do my darndest!. NOW..Sunday night…looks like maybe a day hike on Thursday, Oct. 2nd? Then elk hunting from Oct. 3rd on. EXPLORING “Pioneer Timber Slide” DOWN WHERE SPARROW HAWKS DARE! Up again WHERE EAGLES & OTHERS DARE! I’m just an old geezer trying to keep alive…. 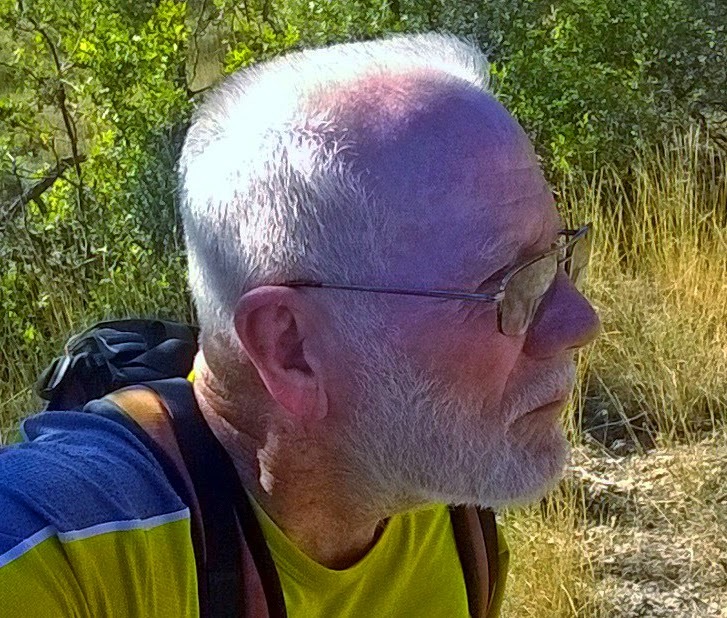 keeping moving today focusing on the recent objective…and do a little to maintain my conditioning for a scheduled High Uinta backpack with my buddy Ted Packard & son, Mike. 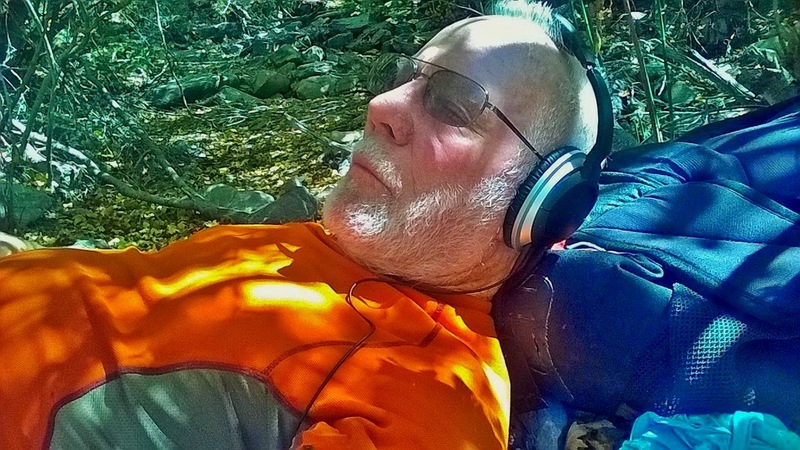 Rest assured that the HIGH UINTAS WILDERNESS PROJECT is ongoing with research & writing going forward and more backpacking will be done when I have resolved a few personal, family & Foundation issues….and a new GLITCH! A newly discovered “glitch,” as I have called them, has been developing for quite a while, but recently its worsening had me identifying it as PERIPHERAL NEUROPATHY in my feet. 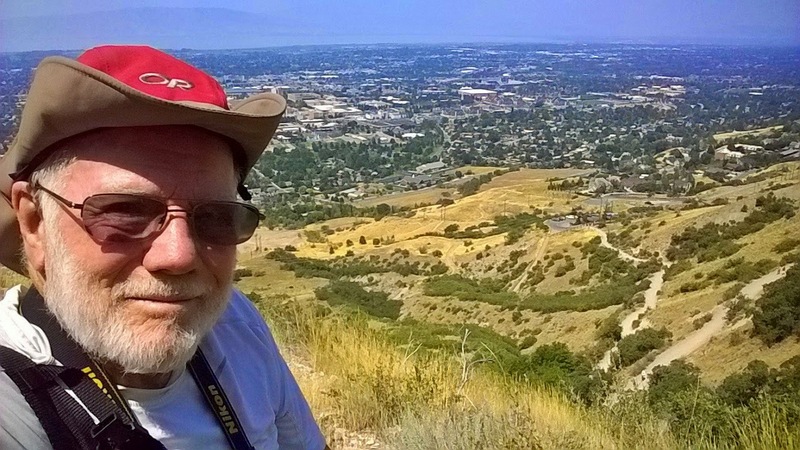 So far it miraculously is not manifested with a 30-50 lb.load on my back, nor when doing heavy duty hiking….like I did today from the foothills up the paths of the timber slide. I envisioned what we see below, but without the water, rather gravity carrying the timber on a REALLY WILD RIDE down to the valley & have been looking for remnants such as old planks, braces, square nails, etc. 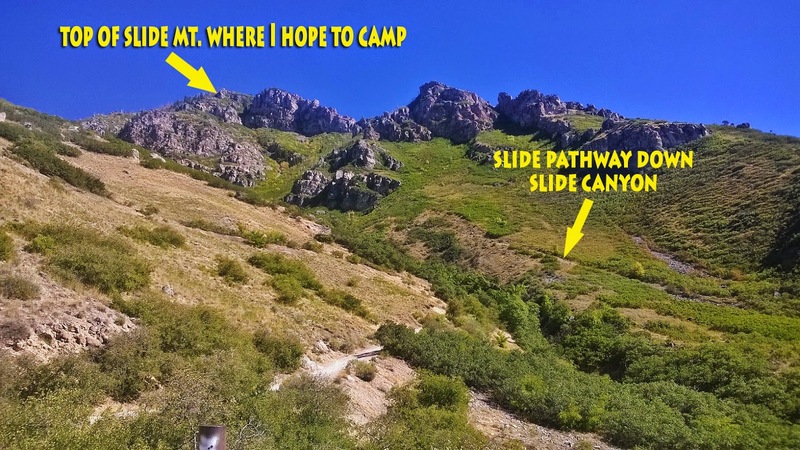 So off I went to explore the timber slide pathways that come down Slide Canyon, as seen below, and down the face of the mountain in the first image. This is a Fall view of the pathway from Eagle Pass.. Below is a Google Earth view of the area. 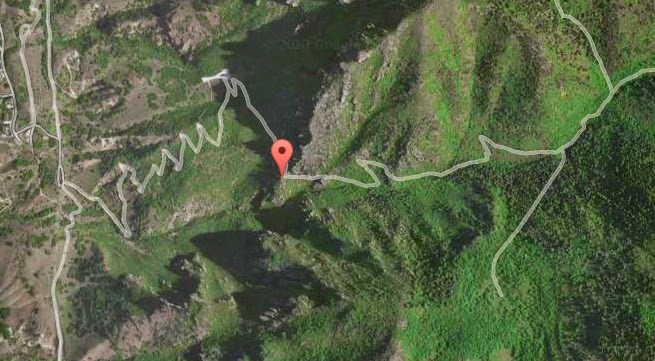 ..In this Google Earth view we see the switchbacks of the Y Trail climbing up Y Mountain, and the ravine of Slide Canyon, with the pioneer pathway over on the south side of the canyon. 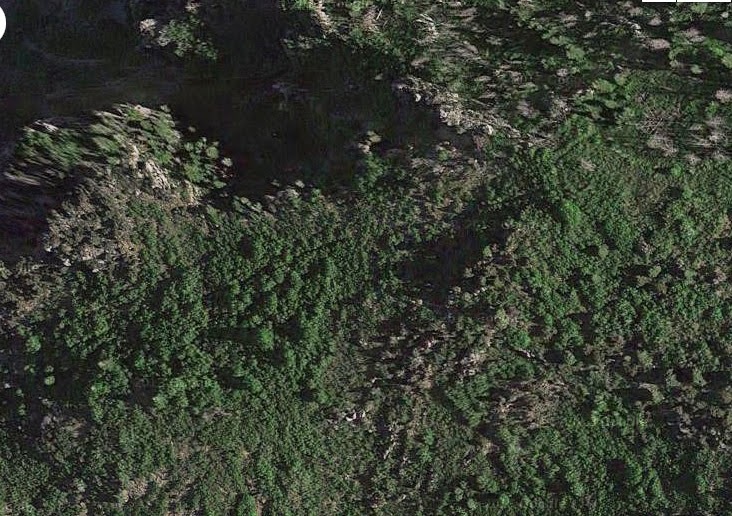 Here we have zoomed in a bit on the pathway that we assume is one of what seem like two Timber Slides, this one after which the canyon is named. From Google Earth the pathway disappears as we get into the very rough area of Eagle Path, but in my last “Attempt” I took pictures of it, where visible from the Y Mountain & Eagle Pass trail. 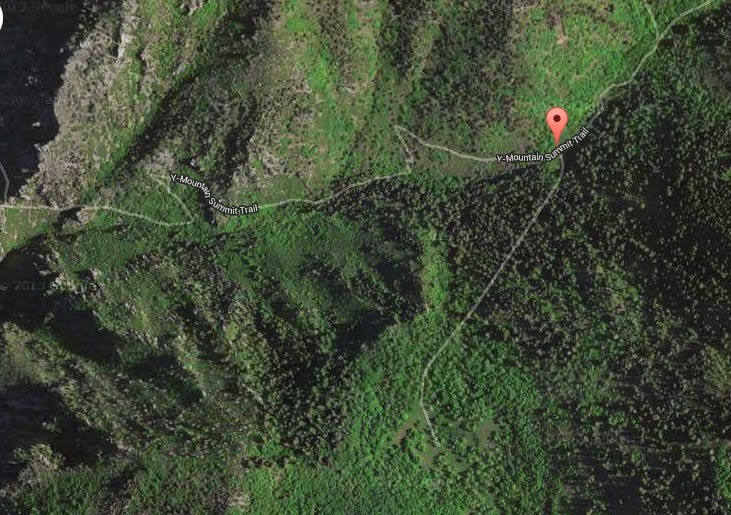 Higher up it reappears in Google Earth as seen below. Here we see the pathway again coming up out of the ravine, and going up the mountain into the trees leading to the Maple Flats area, from where the other pathway begins and goes down the face of the mountain. So off I go my objective being to hike along the foothills and explore the lower ends of the two pathways, hoping to find remnants and artifacts from the timber slide. We begin below the Y Trailhead. Get closer to them…or zoom in and you’ll see what I mean. At the bottom of Slide Canyon we get our first glimpse of the pathway coming down the south side of the steep canyon. The arrow is pointing at a large half-moon area above the pathway, for who knows what purpose? 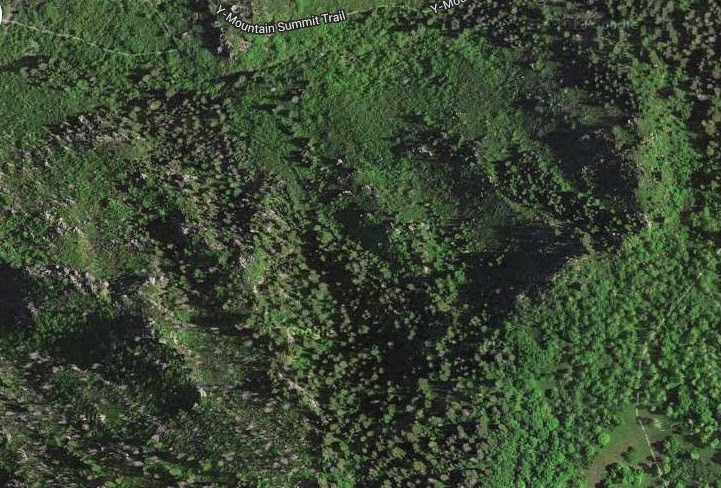 You see it below on Google Earth which is a flattened view that gives no idea just how steep a mountain and pathway we are dealing with and the half moon almost vertical. Here we zoom in on the nearly vertical half moon cleared area. soon I’ll be up there for some close-ups. For me every time wonderful testimonies of our Creator’s kind hand! 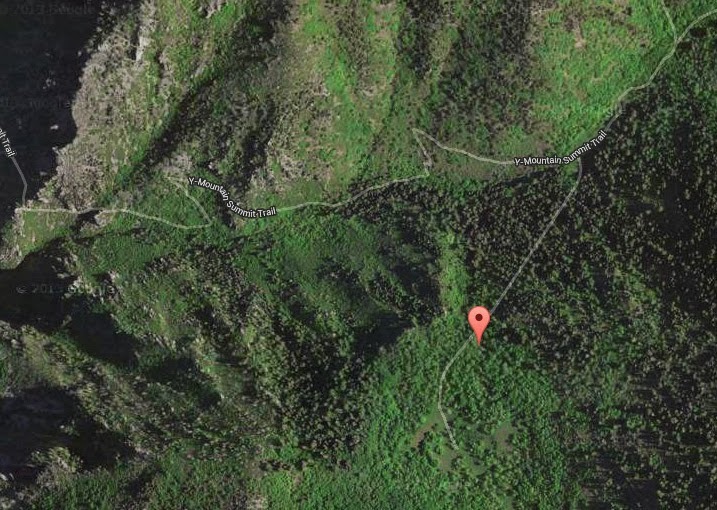 50 yards or so off the foothill road–or BONNEVILE SHORELINE TRAIL, I begin following the pathway, first hitting my SPOT Tracker OK button. The pathway disappeared into the scrub oak, tunneling through. To keep us oriented as to where we are I’ll take photos from each spot looking back down, seeing here the eastern edge of Provo. From this point the pathway goes straight down and seems to end at the foothill road, which the Bonneville Shoreline Trail follows. The steepness and roughness of the area can’t really be appreciated in these photos. Often I was scratching and clawing my way up the pathway. At this point a trail crossed the pathway. Sometimes the trail followed the pathway, but usually zigg-zagged up the mountain, and was much easier to hike than the much steeper pathway that followed a more direct route up the mountain.. Here we get our first glimpse of hikers on the Y-Trail. Soon the pathway will take us up above the first turn of that trail. We continue up the pathway, not finding any kind of wood artifacts, much less square nails. Usually it was quite wide as we see here…at least 2 to 3 yards. Below looking back down from the same point. We are now above the first turn on the Y-Trail. 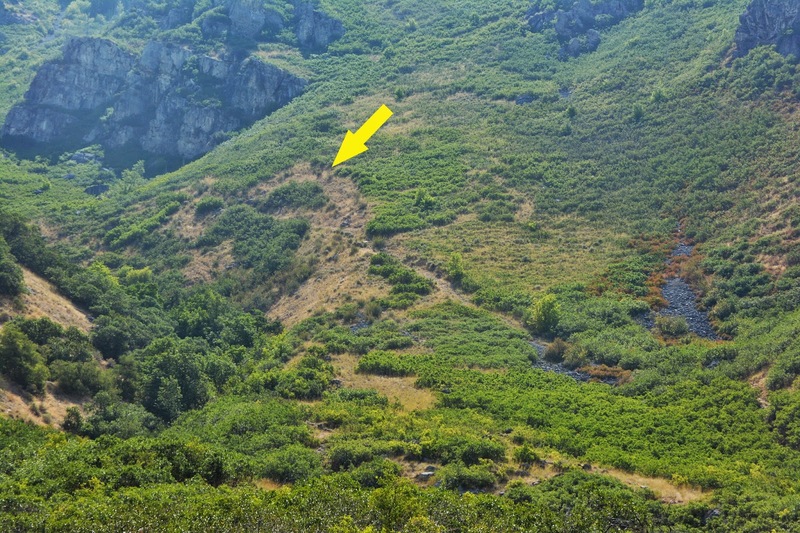 I hit the SPOT OK button, but apparently was too impatient, so it didn’t register, but the spot was basically as indicated below by the arrow, at the lower part of that area with a wide half moon cleared above the pathway–in very steep country. Here we see the pathway continuing up the canyon. 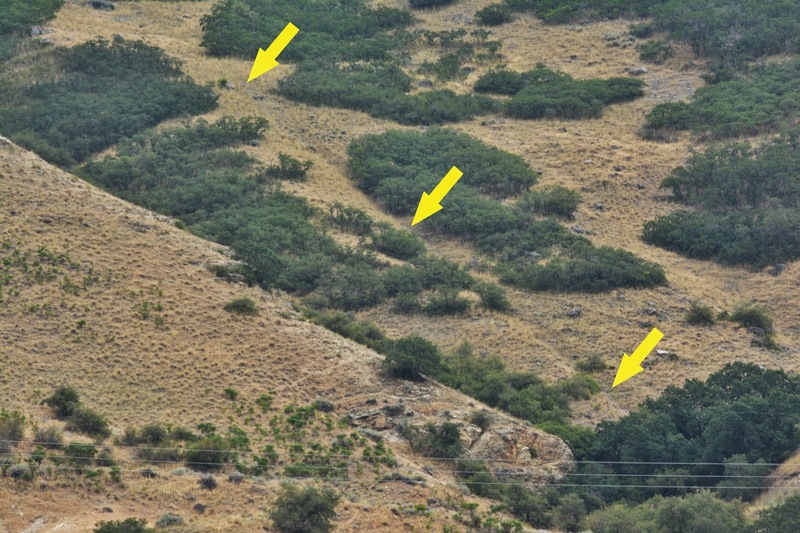 The half-moon cleared area (of scrub oak) is very steep and covered by tall grass and dry underbrush as seen below. This is the view looking straight down from the same spot……. 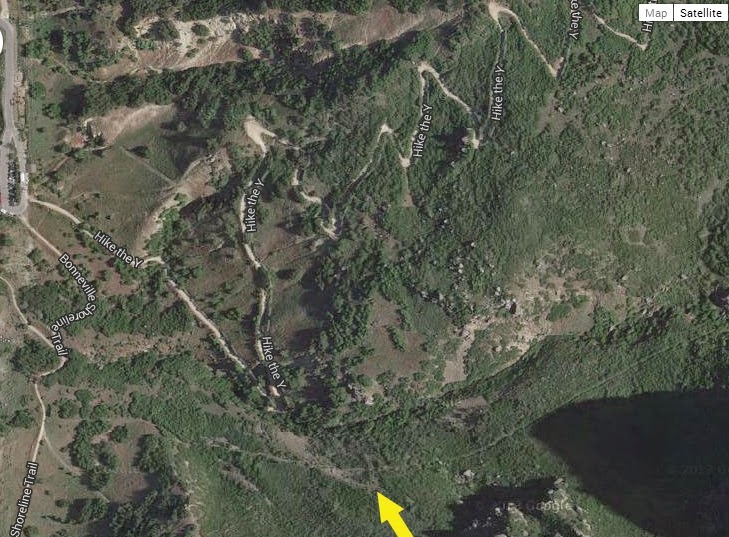 Zooming in on the Y hikers. 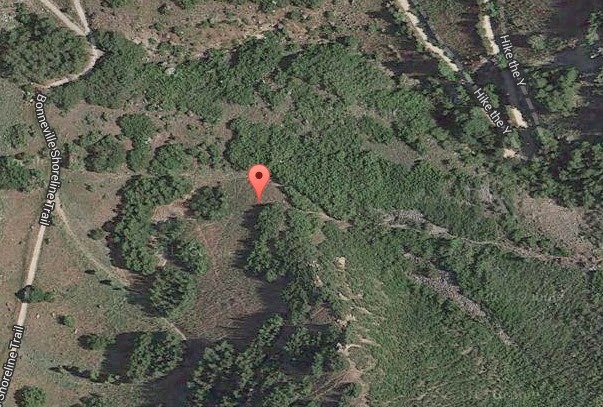 This was the highest point of my exploration looking down, and with the Google Earth view below, showing the SPOT Tracker OK symbol. Here we are looking up towards Eagle Pass. I found no remnants or artifacts that most assuredly would have been there if they had of actually built a flume-like timber slide. I entitled this effort “DOWN WHERE Sparrow Hawks DARE,” since it would be down in lower terrain, but didn’t get a shot of a Sparrow Hawk, rather a Red Tailed Hawk. In this view looking up at Eagle Pass, we can see glimpses of the pathway from the bottom center, up through te middle of the photograph. The pathway continues up in very steep, rough terrain. I’m now on a game trail zigg-zagging up to the top of the ridge leading to the face of the mountain. Above we can see the pathway of the slide angling across the picture. I have now come around to the face of the mountain and head down what was such a steep mountain that for the first time in my life I found a stout staff to steady me and brake my descent as I scrambled down. 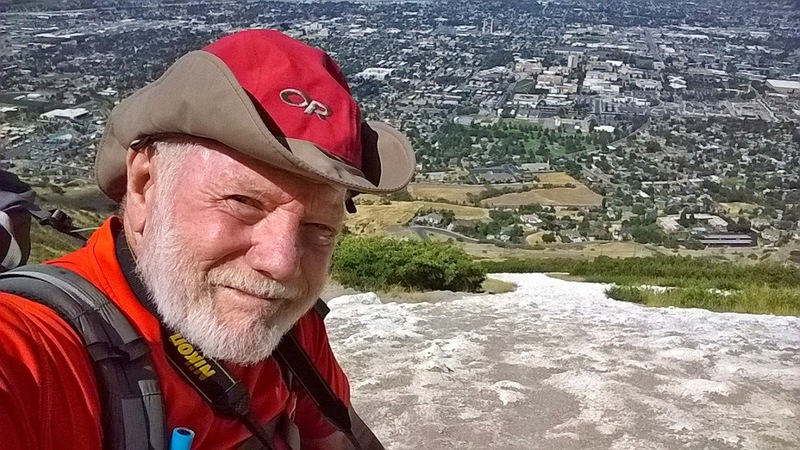 I might mention that during my COMEBACK efforts in 2012, of which I made a whole series of YouTube videos, finally resolving to be a cripple–before giving the doctors another chance or two, I could have never climbed up here, nor made it back down in one piece. HOW GRATEFUL I AM FOR WHAT SEEMS LIKE A MIRACULOUS “2nd CHANCE” TO KEEP MOVING!. But soon noticed round nails, which were invented in 1910, so I was looking at something that had nothing to do with the pioneers. At about the point where the prints I had of Google Earth with me had the pathway coming down the face of the mountain to the road, I came to this gate, and it was there I hit the SPOT Tracker OK bottom, took a rest and drank some ice water, and then got in position to photograph what I could distinguish as the pathway of the flume–actually seen in the photo below directly over my right shoulder.. I had got enough good exercise for one day, so will wait until next week to follow this pathway just as far as I can……and report. 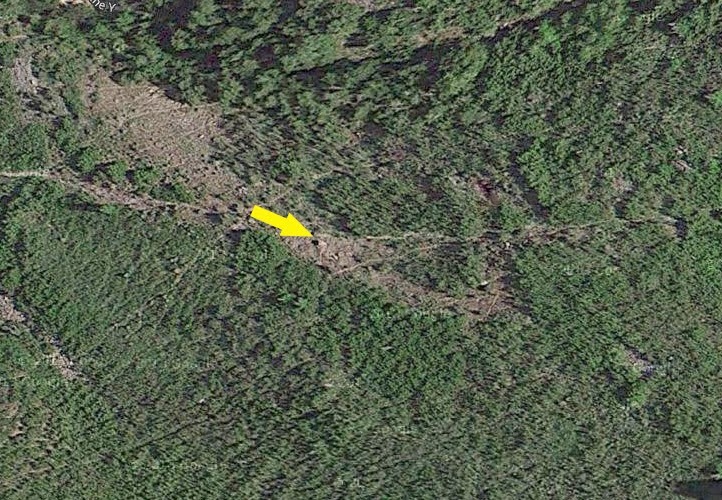 I could see the pathway coming right down through the center of the photograph, pinpointed below in the Google Earth view. Eventually I got an angle where it is more visible….seen a few pictures below. My SPOT Tracker OK signal is seen above, as is the pathway in this Google Earth view below. It is also quite visible in this Fall photograph and the close-up seen below. This close-up of the pathway actually seems like a created shallow trench in the lower portion. For this I found a historical reference I will quote in my next report when I will hike up the pathway as far as I can. From this angle I was able to see it quite well. Zooming in up high I could barely see it, but it’s there as we can see on Google Earth seen below from up high where it begins in the upper right corner. So, I headed back to the car calling it a day…..except for this beautiful little guy I photographed along the way. I envisioned the following, but without the water, rather gravity carrying the timber on a REALLY WILD RIDE down to the valley & been looking for remnants of such…NOTHING FOUND SO FAR. So, HOW DID THE PIONEER TIMBER SLIDES WORK? I’ll be doing more research in trying to figure it out. Do any of you have any ideas? Let me know what you think. 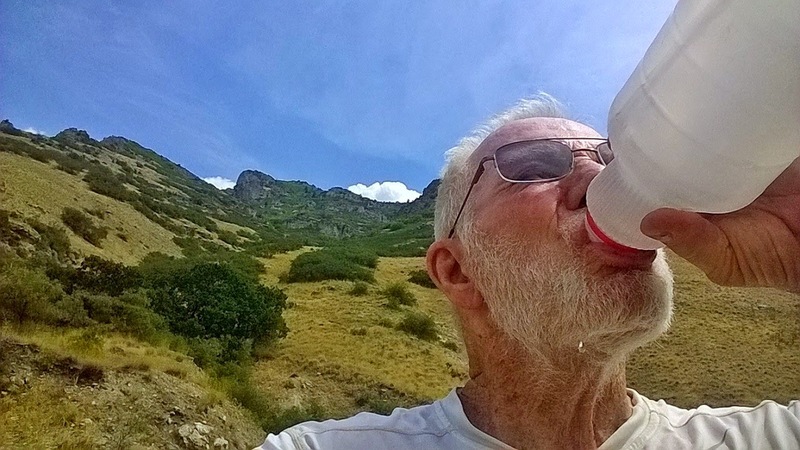 As an old geezer trying to keep alive…..I’ll keep moving today focusing on the recent objective…and do a little to maintain my conditioning for a scheduled High Uinta backpack with my buddy Ted Packard & son, Mike. I envisioned the following, but without the water, rather gravity carrying the timber on a REALLY WILD RIDE down to the valley & been looking for remnants of such…not found. Click to : SEE MY photo report from Sat. Aug.9th trip. NOTE: I just found historical reference to the timber slides and will update when I have a little time. NOW scroll down & go with me…….. I got a bit of a late start, 9:00 AM, when the sun was just coming up over Y-Mountain. 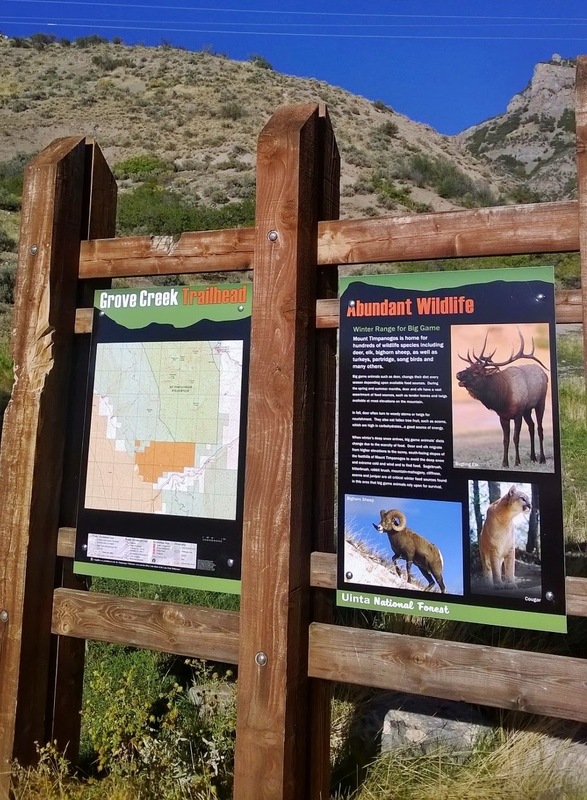 This sign is at the entrance to the Y-Trail Trailhead area on the foothills east of Provo, Utah. The objective again was to find vestiges, remnants & artefacts of an old PIONEER TIMBER SLIDE that I have found a couple of historical mentions of, but so far no details….except for two scars on the mountain where the slide came down from the Maple Flats area south of Y Mountain. One suggests: Just Google it! The problem being that the No. 1 listing, and the only one concerning a timber slide, IS CORDELL ANDERSEN. The others, accompanying me are children’s play apparatuses of the Pioneer brand. I’m in good company! One of them coming down Slide Canyon that divides Y Mt. from Maple Mt., the other coming down the face of Maple Mt. as you see below, with a number of views in my last report. 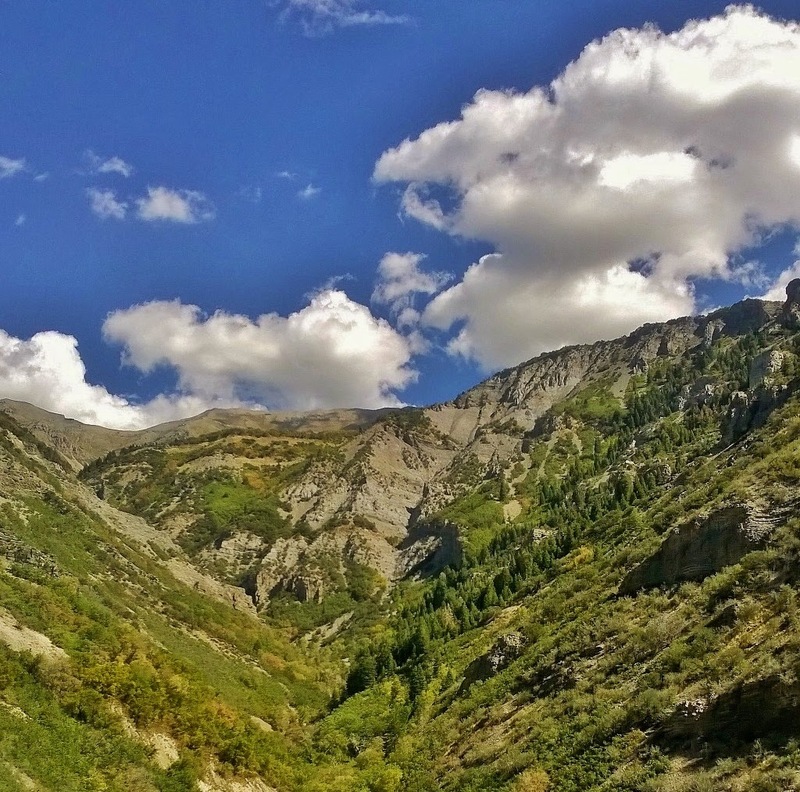 On this overnight backpack I will focus first, as I climb Eagle Pass, on the vestiges of a timber slide, or a pioneer trail coming down Slide Canyon. 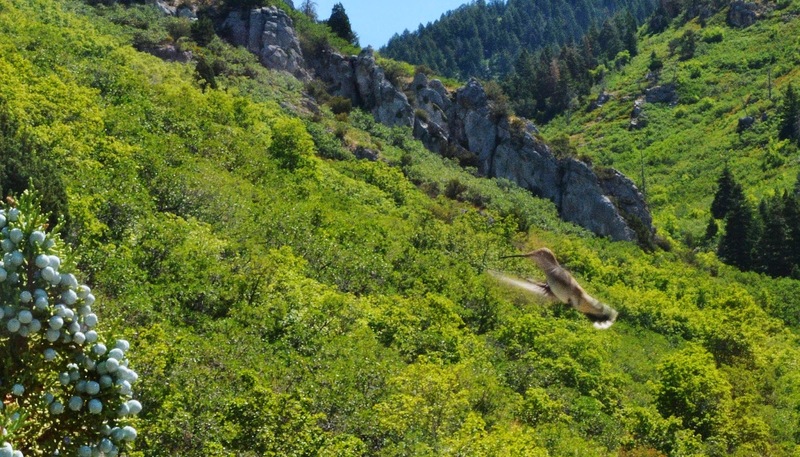 Of course I will not miss any of the amazing VISIONS OF NATURE an observant hiker (with a zoom lens) can’t miss….in our wonderful Wasatch Mountains. Looking up towards Eagle Pass….WHERE EAGLES DARE! In an hour or so I made it to the Y, and kept climbing towards Eagle Pass. “WOW! 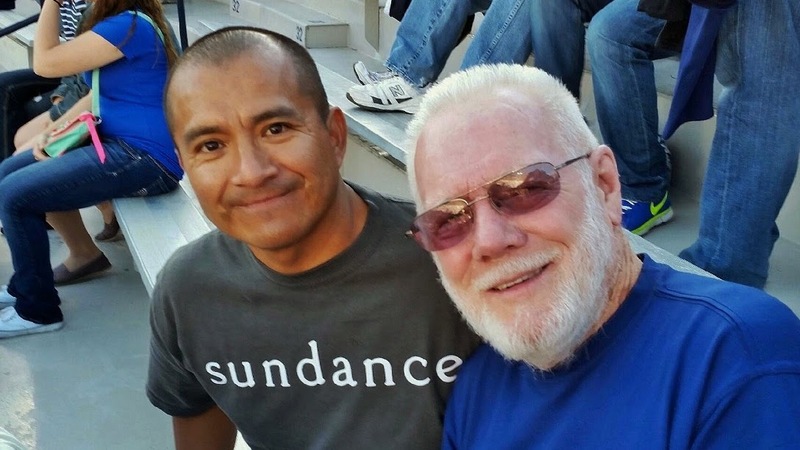 What a couple of good kids,”….thought this old guy in his 79th year! Here’s a VISION OF NATURE I missed on my previous trips. At Eagle Pass I hit the SPOT Tracker for the 3rd time. From Eagle Pass we look down at the pathway coming up from the foothills. 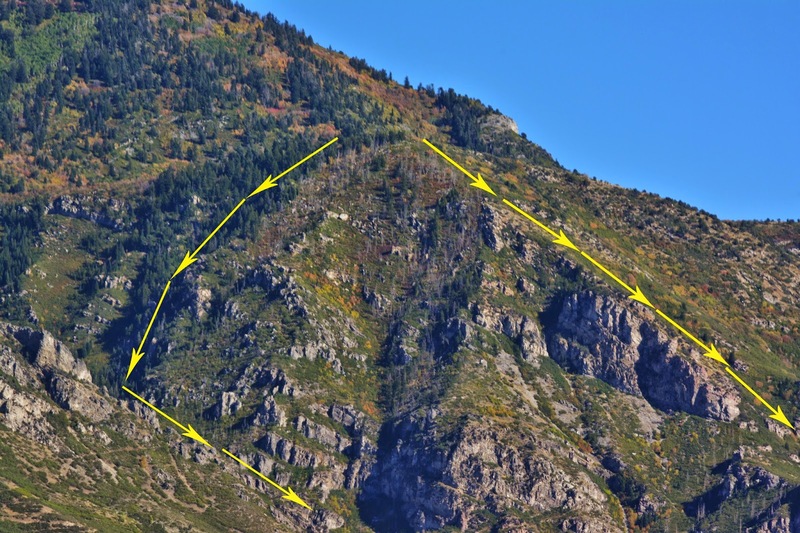 Is it the pathway of a timber side, or just the trail the pioneers used to get up on Maple Mountain? 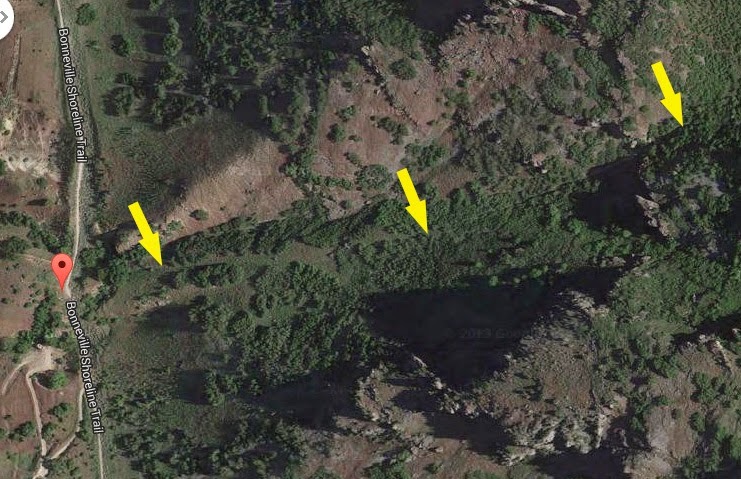 Here we see the pathway from the Google Earth view before it reaches the very rough ravine of the canyon. The pathway then comes to the rough ravine. I zoomed in on those segments that are visible. If there was a V shaped slide coming down this pathway, can you imagine logs being turned lose making a wild ride towards the valley? They would never make turns like the one you see in the bottom right above, rather jump the slide in spectacular fashion, unless there was some way of controlling the speed of each log. The pathway continues crossing the the picture from this corner up, and is barely visible as it continues up. I zoomed in even more to hopes that enlarging it on my computer I could see artefacts…old pieces of slide braces, supports, etc. but I can’t detect anything, but will insert the shots anyway. I proceeded up the trail in what I call the Eagle Pass Area–with 3 passage ways, and a long switch-back area,. We look to the north at the south side of Y-Maountain. We’ll see the divided suumit better in a few minutes from higher up. 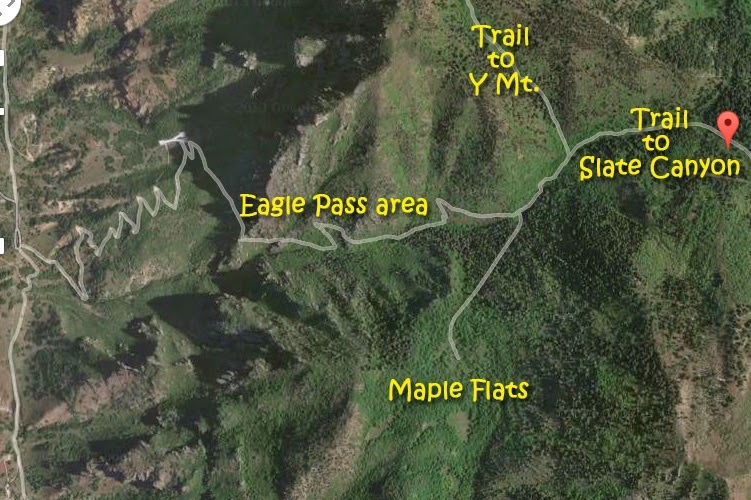 We have progressed up the Eagle Pass area, and see here a Google Earth view I showed in the last part of my Attempt #1 photo/essay, that shows to the right the trail that comes up from Slide Canyon to Maple Flats. But the important part is a continuation of the pathway that leaves the ravine and climbs the mountain crossing right in the middle of this shot. See it enlarged below in dead center..
Below we see it faintly from the hiking trail, and you will notice that the flat looking picture above is in reality very steep rough country. It goes, or comes down through, the pines up above. As I say, very steep, rough country. What I wouldn’t give to be able to actually see what was going on here 150-60 years ago. I need to find some old pioneer journals, letters, records that describe what was going, and the specifics of how they undertook such a gigantic task. 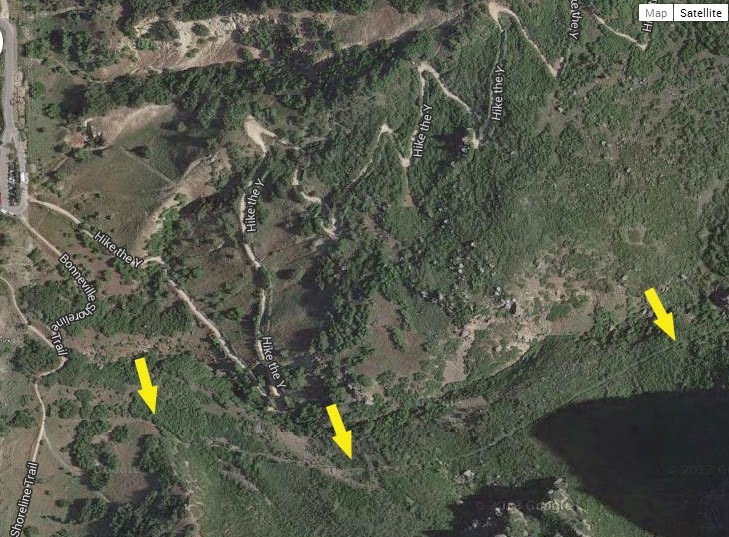 In this shot we can see the pathway cutting across the upper right corner, but also the path continues up Slide Canyon as we see in the lower left portion of the picture. Then ZOOM into view a live VISION OF NATURE and we forget for a few minutes pioneers and slides and think of humming birds. With a series of the best shots I got of these hard to photographs tiny VISIONS of beauty. …..nonetheless magnificent little natural engireering marvels. I should have had my flash on, but it all happened so quickly. Then we come to the 1st meadow where years ago I was nearly stomped on by a herd of deer….and hit the SPOT Tracker OK button while resting a bit. I still even had a bit of ice in the nearly two gallons of water I carried….16 lbs……just in case I didn’t find the water good in the spring that is a bit over half-way up that slope towards Maple Flats. I’ll admit my first attempt failing to find the trail, and with water gone had to head down the mountain. But not this time. Just after you get to the meadow you’ll see to the left a shady spot where I have rested several times. Directly in front, or to the south a short trail takes you to this campfire area. Straight through it a trail heads for the pines and I took the bait the first time, and ended in a maze of game trails that led nowhere. 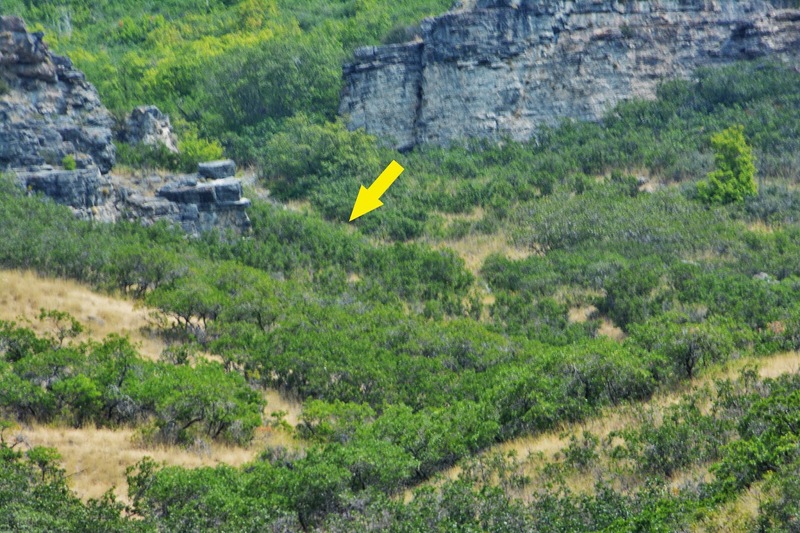 But, look to the right of that rock, and you will barely see a trail taking off….THAT IS THE TRAIL TO MAPLE FLATS. I should have put a larger pile of rock markers, but I did mark it, and hope they survive to guide hikers. Up the trail we go. The only major obstacle on the steep trail, sometimes almost hid by vegetation, is this downed tree. No Trail Crews to make it easy going. The vegetation becomes lush as we angle down into the gulley. We find the spring that my brother, Marlo, says he found dry a couple of years ago. I hit the SPOT Tracker to pin point the exact location. Filtering through a slimy, but likely clean, growth of moss. 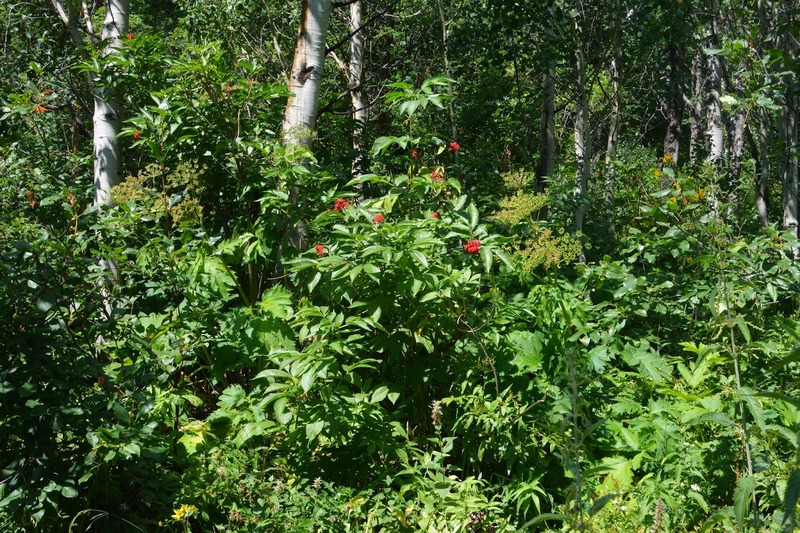 The vegetation in this whole area is lush to way the least, with a wide variety of bushes and flowers. Like Monks Hood that you might remember from my High Uinta programs. The trail often is unseen, tunneling under the jungle-like vegetation. Oh, and did I mention STINGING NETTLE? I did in my last photo/essay, but didn’t really show it very well. Well, here it is, and it was everywhere….and I HAD SHORT PANTS! Talk about dumb! This became a very serious problem, to say the least. We are coming to Maple Flats, with Maple Mountain rising above it. I found a spot in the meadow and with a stout stick cleared it of stinging nettle and set up my camp. It was near here, bivouacked on a mattress of straw protecting me from the snow, when I got my very large male coyote on a deer hunt as reported in my last photo/essay. 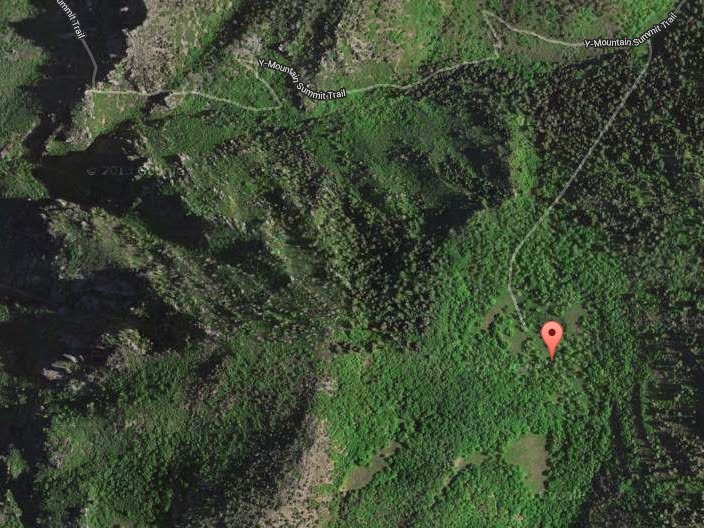 I hit my SPOT Tracker OK button to pinpoint my camp site and to let everyone know I was doing great. 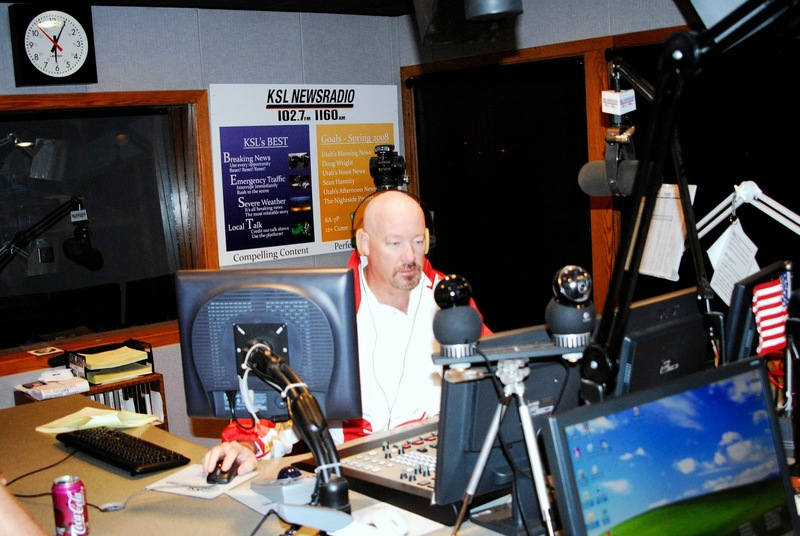 In the morning, at about 6:22 AM I made my phone report to KSL Outdoors Radio. It was nice being able to listen clearly on my transistor radio and have a good cell phone signal. Sometimes radio reception is difficult in the High Uintas. After the program I was up to see what I’d be able to accomplish. This would make it painful…and even impossible to do the exploring I had come to do. I tore open a couple of my gallon sized Ziploc bags and with tape covered my legs…and it helped some, but eventually I gave up. Another of the problems was that after having my breakfast, that I had put to soak the night before, I only had a bit less than 1 quart of water. I would have to be very careful, and likely be forced to go back by the spring and see if I could get enough water to get me down the mountain. I poured it in my water canteen, and eventually added to the water an electrolyte replacement powder as I l knew I’d be sweating profusely once out of the shady Maple Flats area. I took all the necessary energy supplements, MCT oil .and had 3 FRS chews ready in my pocket for later. I will report in a special post the supplements that got an old guy through a very difficult day….and in fine shape, and raring to go again! I got a good stick (I needed a machete) and began beating my way up through the stinging nettle and over a little rise that took me to the big meadow, now on the dry, southern portion of the Flats. The difference was incredible, the grass dry already, but in the surrounding forest areas a dense tangle. 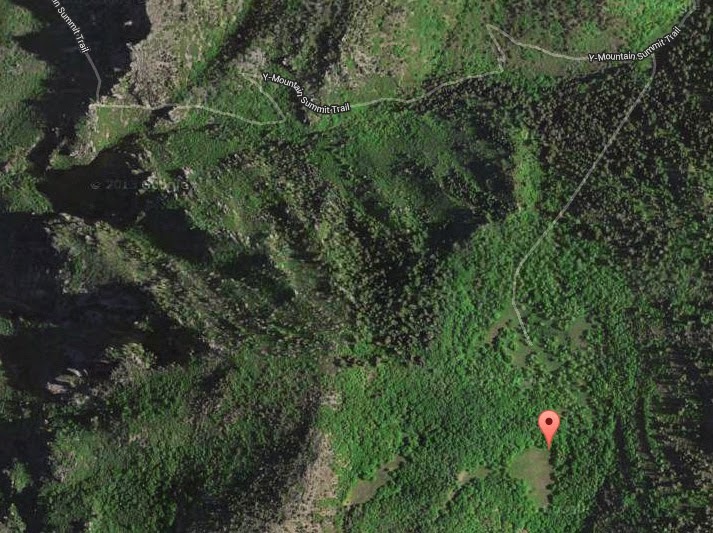 At the edge of the big meadow I hit the SPOT Tracker OK button to pinpoint the area. In all of this it became obvious that what I need for this task a good GPS to see at any moment where I was, and where I had to go to find what I was after. 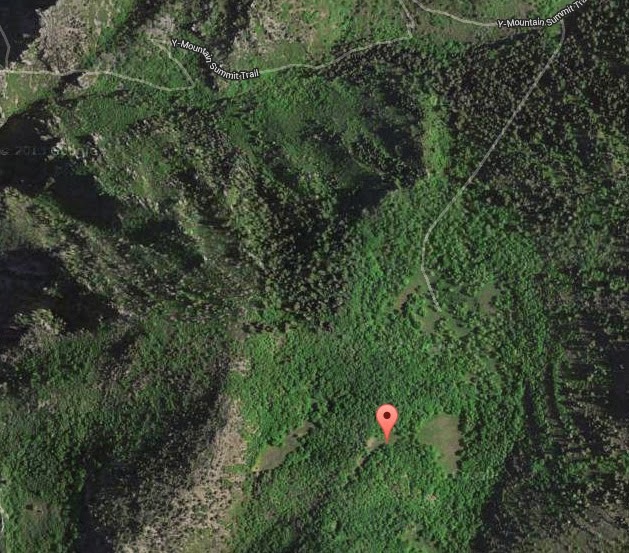 It would have been also incredible to have in a number of instances in the High Uintas. 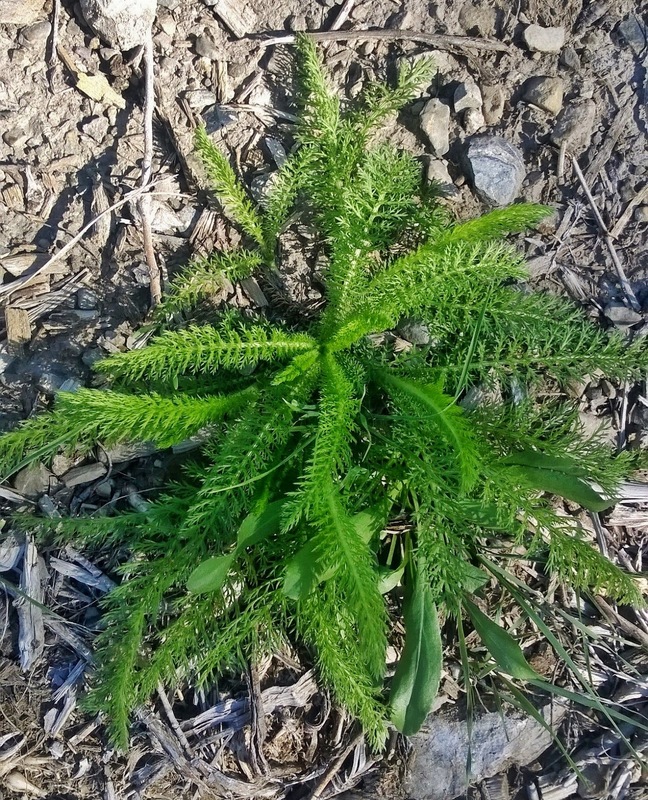 I haven’t been identifying hardly anything, but I have to mention this one, which I was surprised to find up here, as it is commonly a lower elevation plant. I walked down to the lower edge of the meadow and hit the OK button. The forest was like a jungle. I decided I would wait for the late Fall with vegetation gone, and leaves off the trees, would have long pants, and a machete….and lots of water as for sure the spring would be dry then. This is looking up at Maple Mountain above the flats. I was too far south for anything of my interest and so headed back where I had come from on the north side of the Flats. I tried to work myself into the forest that covered a hill I had to climb to get to the other side and hopefully find what I was after….but it was hopeless, and my leg protectors didn’t last and I was out of tape. Even a day later I still have a few spots of stinging on arms and legs..
. From where I had got to I headed cross country hoping to find the spring, but it was thicker than any jungle I had ever seen in Guatemala, and taking the course of least resistance I got too low, missed the spring, wore myself out, and had the tender skin on my arms bleeding scratches all over….but eventually found the trail and headed down without getting any more water. I would have to be careful and make do what remained…maybe half a quart at most. The forest was in one way very impressive. I couldn’t see any sign of the Pine borer beetle that is devastating some areas of the High Uintas. While resting down the trail…..I sensed I was being watched, and….wouldn’t you know it I was being spied on! Itr was a rock squirrel and I waited him out hoping to get a shot of his beautiful bushy tail, but no luck. But did sneak up on him some…..
More wonderful VISIONS OF NATURE……..
another rare flower I didn’t get a shot of on previous trips….but with this one….. I had zoom in to show you I’m not crazy…and that it really is a wildflower. Next time I’ll put the closeup lens on and blow up just one of the gorgeous little flowers. Soon I was down past the Y seeing the beautiful parade of hikers coming up our wonderful mountain. By then my water was long gone…and zooming in on the Seven Peaks Water Park…had me picking up the pace and getting quickly to my car and what would be warm, but wet water…..and soon an ICE COLD MOUNTAIN DEW! I didn’t hit the SPOT Ok button until getting to American Fork completing the SPOT Tracking. This is what you would have seen if you had gone to my website and got the link to the SPOT website. I’ve added the titles. 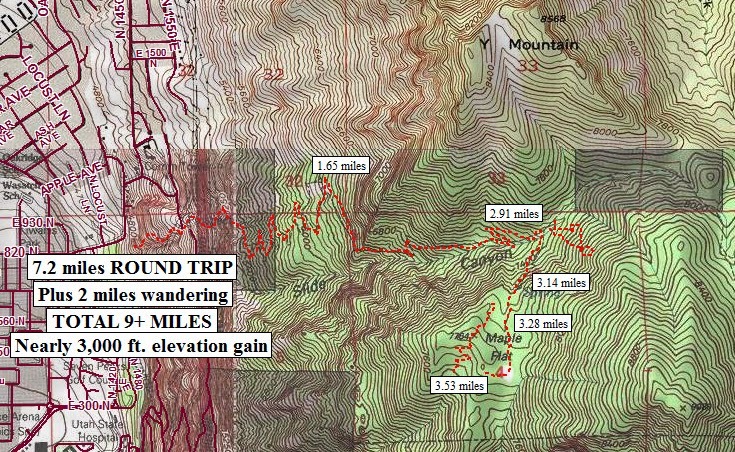 This is the topographical view from the National Geographic CD/Rom, showing I had done a bit over 9 miles, with around 3,000 ft. of elevation gain in the approximate 30 hour hike. I will be doing research on the Pioneer Timber Slide in the next couple of months, and explore the lower portions of the pathways I’ve shown you and see what I can come up with, and hopefully in the Fall be back up there in hopes of finally having a clear picture of what had to be a very hard and difficult pioneer effort to have the lumber they needed to create Provo, Utah. 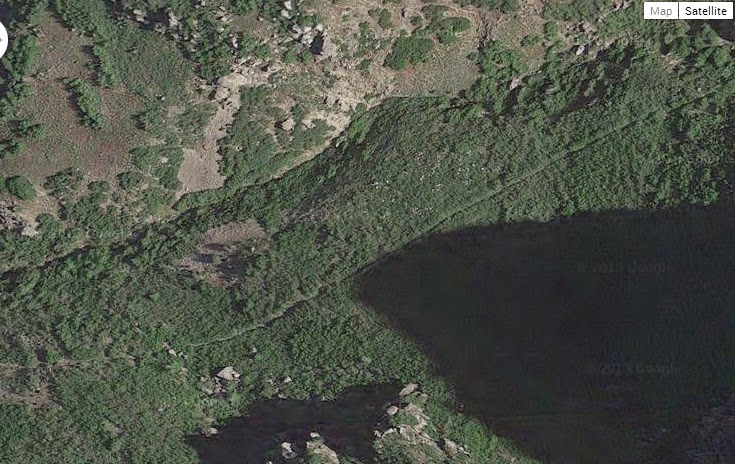 Again, just try and imagine a V shaped slide, like the Hilliard Flume I have reported on from the Uintas. The flume carried wood products 30 miles into Wyoming, the water carrying the ties and logs at 15 miles per hour. 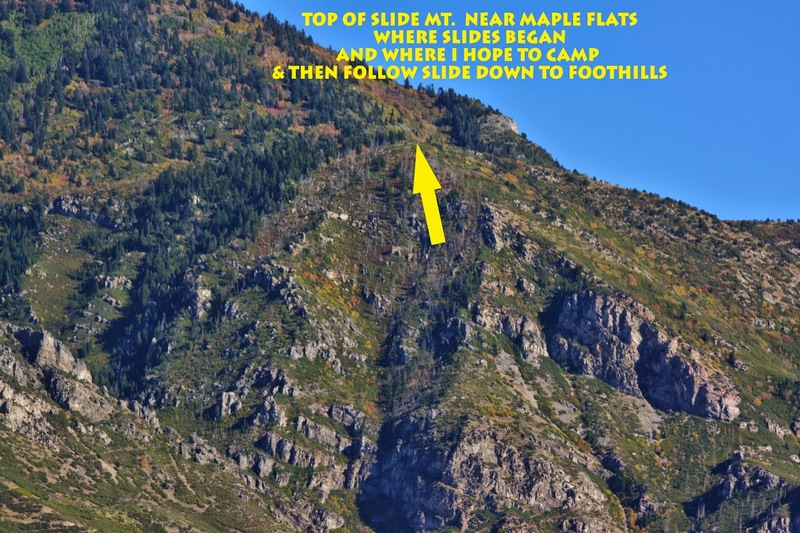 This timber slide or slides, several miles long with 3,000 ft. drop in elevation, worked how? Could they just have turned logs lose to make the wild dash to the bottom? Incredible speeds and power would have been achieved. about some old photographs, or sketches?